If you are a frequent visitor to this site you probably know that I focus a lot of my effort into color scales. I often reference the color.gs script as a must have script in ones script library. I have additionally added the script colorset.gs to the script library for use with common remote sensing color scales. This script here is similar to colorset.gs, but different in the sense that it gives the user control as to what number scale the color map will be set to. 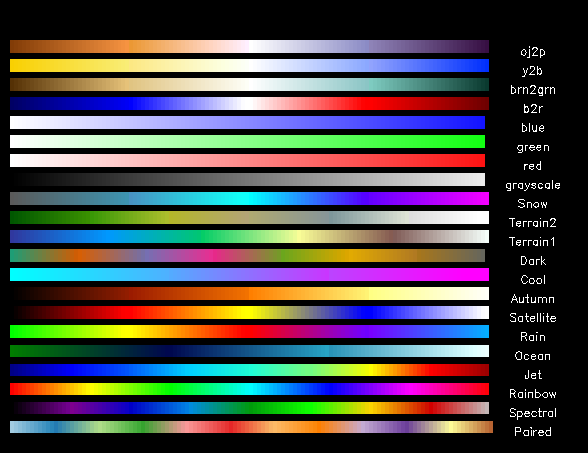 colormap.gs currently includes 21 color scales (with the option of reversing them). These scales are shown below. This series of commands will produce the following image. This is the first version, so check for bugs and please report any you find! It'd be nice if I can specify individual color levels, in addition to min/max/int. How are your calling the script? I am interested to find out if this is a bug. I am currently working on a newer version that includes more color scales and options to specify levels. Also there appears to be an issue with setting the color levels that I am working out. It would be nice to know if there is another bug I need to check out.